Always a fan of the arts, I, like all of the other starving artists out there, am just trying to cut out a place in this world. I devised the FEATURED ARTIST concept to diversify the scope of the website and give credit to up-and-coming graphic artists and photographers who work as tirelessly on their crafts as I do on mine. To inquire about becoming a FEATURED ARTIST, see the CONTACT page. To give some preface to this interview, Pete Hatzipetros is an old friend of mine from Fairfield University. We were fast friends for a few simple reasons: we have very dark senses of humor, we both took cigarette breaks in the middle of the biggest waste of time psychology class ever taught in college, and we viewed people for exactly what they were – imperfect. After graduating together in 2009, Hatzi picked up from Queens and moved to Michigan to study law at the Thomas M. Cooley School of Law in Ann Arbor. He now practices law at Pardalis & Nohavicka, LLP – Attorneys at Law. However, of all the things I thought I knew about him, I never ever knew he was an artist. At the time, I’m not sure he did either. Based on the body of work he has compiled (and continues to compile), he certainly is an artist now. See his biography in the Featured Artist section. What was your inspiration for the Jaded Series, and, in particular, what is the significance of the red line? My inspiration for this series is rooted in my belief that we all have sides to ourselves that contradict the public perception we try so hard to maintain. No one is immune from this, especially those in the public spotlight. 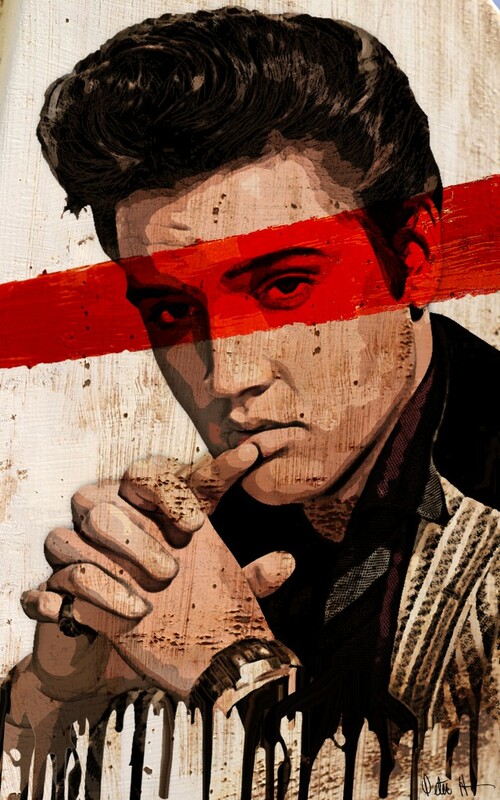 These particular icons all have dark stains on their souls – for example, Elvis’s alcoholism and Marilyn’s promiscuity. The red line is symbolic of these stains of impurity, and the red line covers the eyes because we try so hard to hide who we are that we can become blind to who we’ve actually become. I’d say that my artistic inspiration comes from a subconscious desire to express misunderstood thoughts and beliefs through endless mediums. Whom/what were you influenced by? My mother was always very artistic. She’s always been very encouraging of my work growing up and still is to this very day. I never knew art was a passion of yours when we were together in college. When did you become a graphic designer? How did that come about? I’ve always painted. I have a few acrylic on canvas works, like the dual Joker canvas here. But I came across graphic design while in law school after reading about copyright case where Photoshop was used. I learned about the extensive ways the program was used and looked into it further. Fast-forward a few years, and my interest is still growing. Is it a business, a hobby, or both? I’m asked this question often, and my answer remains the same: I’m an attorney first and foremost. Art is a hobby, an outlet, a passion of mine. However, as my portfolio grows, so does the interest of prospective graphic design clients. And it’s very rewarding to provide art to those who appreciate my work. How long does it take to create, for example, the Slapshot poster? The movie posters, technically, do not take a lot of time. But as soon as I finish creating my vision for a film, another idea to improve the work strikes. This process repeats over and over, so the majority of time spent is on tweaking a finished idea, rather than creating it. How do you do it? What is your process? I’ve had more fun creating the minimalist movie posters than any other series I’ve worked on. As you know, Andrew, I’m a huge film enthusiast of all genres. My inspiration to start this series was motivated by love for certain films, but disappointment in the posters for those movies. I try and capture scenes from a particular film that haven’t been used on posters ad nauseum. It’s a blast, and the feedback has been great. 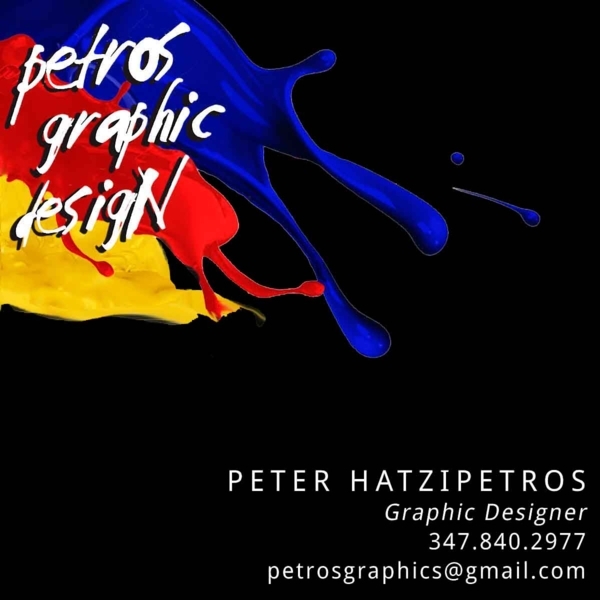 Check back next week for Part II of my interview with Featured Artist Peter Hatzipetros.